Base prices for wrap conversions can be found on the wrap conversion page and base prices for other fabrics can be found on the strap fabric page. Adjustable height - $5 Adjusts the panel down to a smaller height using a drawstring. 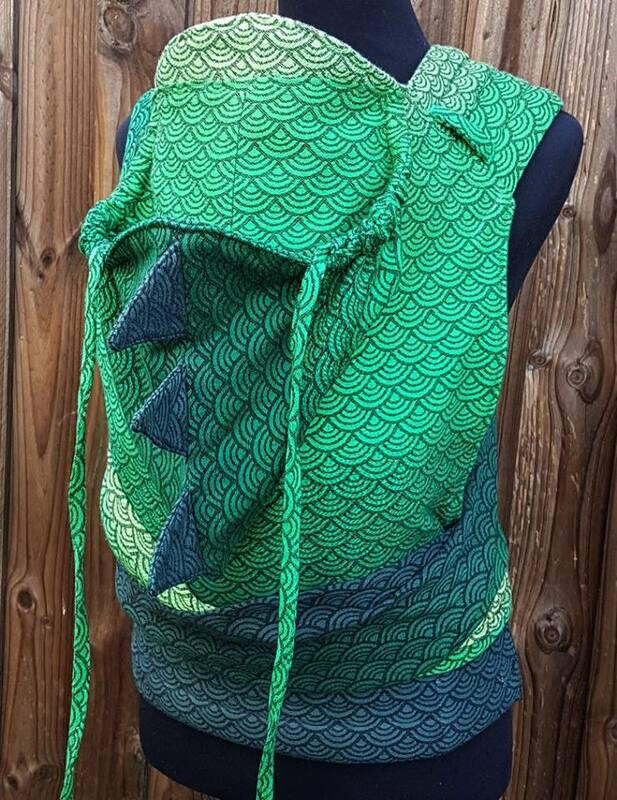 ​Matching print hood (only applies to in stock printed fabrics) - $10 - contact me for availability if using one of my in stock prints. Applique - from $15 for simple shapes and $40 and up for something more complicated (like a scene or a design with lots of individual elements). Contact me for a quote. Measurements for half buckles- The mimimum length of the waistband is 71cm including buckles (the toal length of the waist band is 71cm and the length of the padded section is 63cm). I can make that smaller or longer if you need it. Petite waist is 7.6cm shorter and extra long waist is 7.6cm longer. Total length of waist on half buckles including webbing is 157cm. ​Ring Waist $25. The total length of the waist is 155cm. If you prefer a shorter length let me know. Longer shoulder/waist strap - Meh dai/half buckle standard shoulder strap is 203cm (80" ) and a tied waist strap is 178cm /70" (medium) - 198cm/78" (standard). Print fabric sewn in to create a framed effect. The base can be cinched to a narrower width so baby can be carried with legs out from a younger age. Velcro stops the fabric from sliding back when used in the widest setting. 'Hoodie' style sleeping hood. 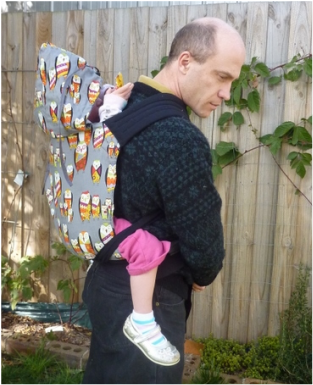 The adjustable version has adjustable ties which shorten the length of the hood for use with a younger baby. A cute pointy hood. Like the hoodie hood this is a large hood and the adjustable hood option is recommended for a better fit for smaller babies. The second photo is a shorter version (but still long) and the style I will use but if you would like to use the even longer version in the first photo just let me know. Can provide some extra coverage for toddlers and preschoolers. Pictured - bear ears, angel wings and giraffe ears and horns, dino spike, unicorn horn and ears, cat ears, reindeer earsk,and dragon spikes. Adds extra height for extra back/head support. With a printed fabric this style can have a solid colour headrest and a print that goes across the width of the carrier or you can choose for the print to extend up to the headrest to cover the whole panel. A hood may be added (a detachable hood works well). Add a buckle and webbing to the waist instead of ties. Buckle shoulder straps and tie waist. This waist has a closed cell foam in the centre and padded with fleece across your hips. It can offer extra support for very heavy children by helping to transfer more weight to your hips. The hybrid waist can't be rolled like the padded waist can. 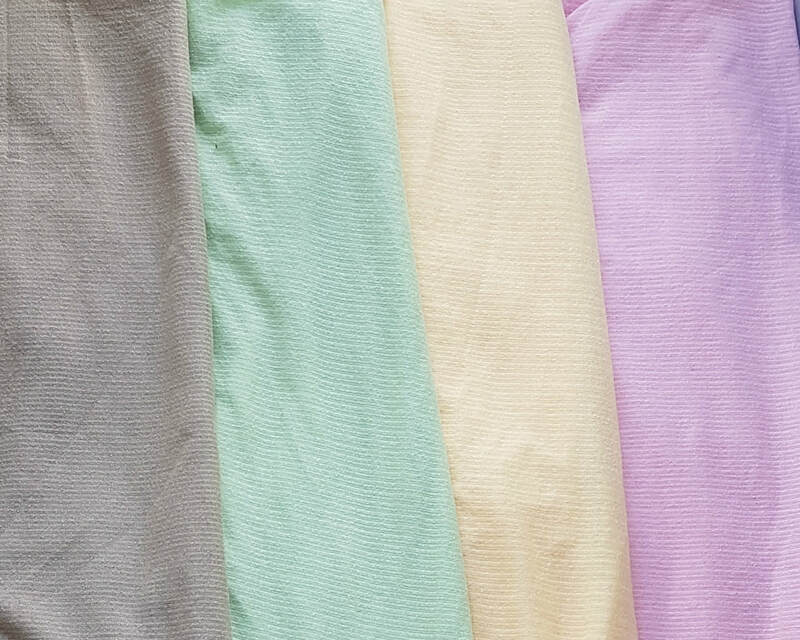 Solarveil panels are available in beige, green, yellow, and pink - this airy mesh is great for hot weather wearing. The hood can be rolled out up out of the way to expose more of the panel if desired. This waist has a buckle but it can be taken off and the waist tied if preferred. Hood attaches with tabs and snaps. 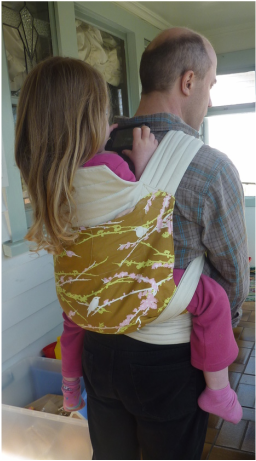 Mei tai's, full buckle and ring sling doll carriers are available. A pocket to slip on your waist strap with removable wristlet strap.